In terms of mass appeal, no soccer event captures the world’s attention like the World Cup every four years. But for serious soccer fans, the pinnacle of the sport is the UEFA Champions League, featuring top club teams in Europe with the very best players. This year’s final, which takes place on June 6 in Berlin pits Juventus of Italy against Barcelona of Spain, two storied clubs with equally storied uniforms. In fact, this just might be history’s best-looking Champions League Final. On the other hand, no one knows exactly how BarÃ§a got their colors, only that they’ve always been blue and red, a combination that came to be the symbol of Catalan resistance under the Franco dictatorship. But you’re serious when you say this is the best-looking final ever? You bet. Check out the historical matchups and judge for yourself. There hasn’t been a final with such attractive and distinctive kits. Plus, both teams are wearing what’s close to the best version of their colors. Barcelona has also experimented with stripe thickness and shorts colors, and they’re switching to horizontal hoops next season, but their current look with thick stripes and blue shorts is arguably their best combination (though the less said about their DayGlo change kits, the better). And the sponsors? 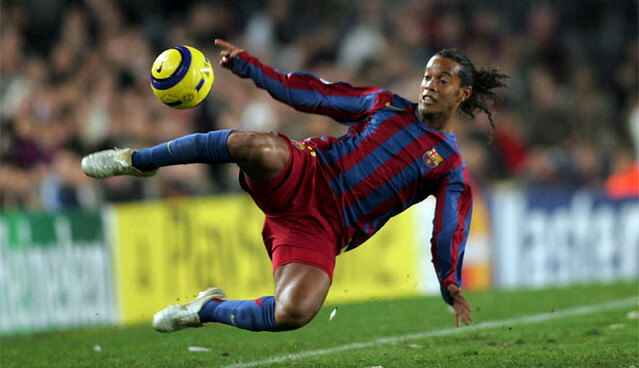 Barcelona once prided themselves on not having a shirt sponsor. That changed in 2006 with the UNICEF logo on the chest, but at that was for a good cause. 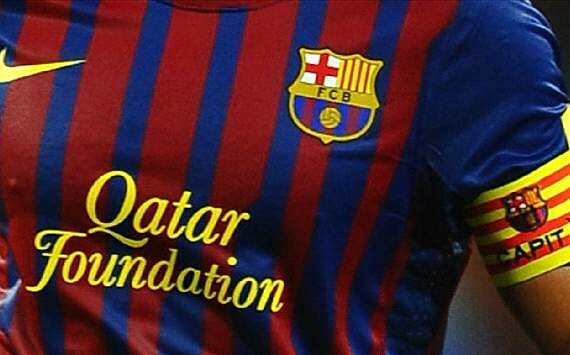 In 2011, they began promoting the Qatar Foundation (with UNICEF relegated to the back), but still, that was a non-profit. In 2013, they gave up all pretense and switched to Qatar Airways and did this really embarrassing thing with “Intel Inside” inside the shirt. 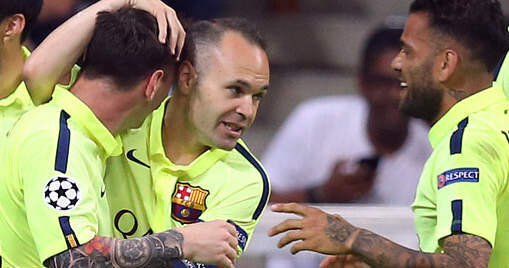 At least tournament regulations prevent Barcelona from advertising Beko on the sleeves. 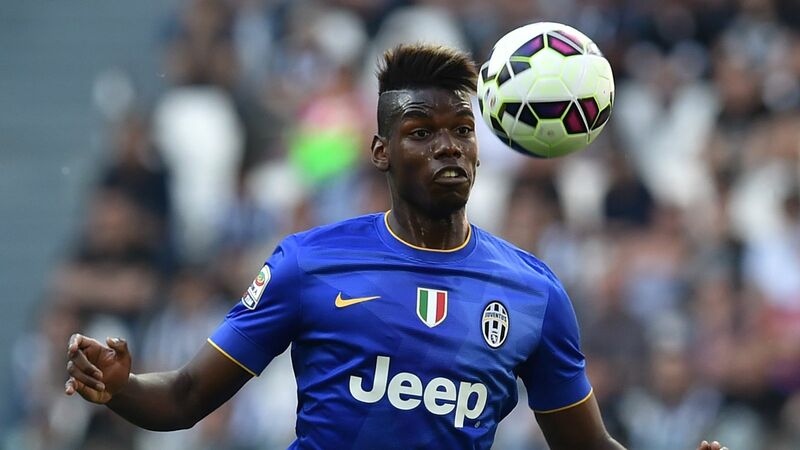 Juventus has a less complicated sponsorship deal with a subsidiary of Fiat, the auto giant from their hometown. You might have heard of them. How’s that Nike/Adidas war playing out? Both Barcelona and Juventus are outfitted by Nike and reached the final by beating Adidas-sponsored teams (Bayern Munich and Real Madrid, respectively). 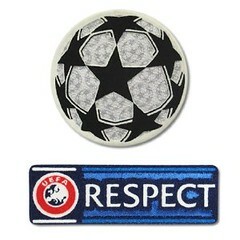 The two companies have dominated the Champions League finals, accounting for 19 out of the 20 champions and runners-up. Okay, so where do I watch the game? The game is on Fox at 2:45pm Eastern on Saturday, June 6. Stroll down to your local Italian or Spanish bar for maximum atmosphere (though a British soccer pub will also do). Thanks to a recent tip, I think I now have the answer, although I’m still putting a few of the puzzle pieces together. The bad news is that the person in question is no longer alive; the good news is that I’m in touch with his widow and children and am working with them to try to document his role in Mets history. Interestingly, this situation is very similar to the story of Jerry Dior, the MLB logo designer whose recent death has been in the news lately. Dior was never credited for his work and had no documentation to back up his claim, but his role was eventually verified by several colleagues who had worked with him when he created the logo. Finding contemporaneous colleagues may be trickier in the case of Mr. Met, because the character first appeared in 1963, so many primary sources from that period may no longer be living. It’s still too early to know how this will unfold, but I’m cautiously optimistic. More soon, I hope. A fond farewell and a well-earned promotion: For the first seven-plus years of this site’s existence, I did all the weekday Tickers myself. Then, about 18 months ago, I took the momentous (to me) step of hiring two Ticker monkeys interns — Mike Chamernik (far right) and Garrett McGrath — and let each of them handle the Ticker for one day per week. It’s been a big success (well, at least for me, because now I can spend two days a week watching Power Puff Girls reruns and taking naps). Today I’m announcing a few changes to that setup. Garrett recently decided that he needs to devote more time to his writing projects, so he’s bidding Uni Watch a fond farewell. Mike’s been doing outstanding work, so I asked him if he wanted to take on Garrett’s duties in addition to his own, and he readily agreed. I’m hoping Mike will also do more lede entries, like his recent series on team fight songs. Both of these guys are awesome. Please joining me in wishing Garrett well and in congratulating Mike on his increased role in the Uni Watch family. What are some of your favorite smells in sports, and do they conjure up any memories? The aroma of popcorn in the air while watching a game is a pretty good one for me, as is the smell of a leather baseball glove. And for whatever reason, bowling alleys have a pleasant signature scent. And what about your least favorite smell in sports? When covering high school sports last year, I learned first-hand that hockey locker rooms really are the most foul-smelling places on earth, just like they’re reputed to be. However, that funk will remind me of the games I saw and the stories I wrote. Baseball News: Indians P Carlos Carrasco had an orange rubber band on his left shoe the other day to honor Mike Aviles’s daughter, who has leukemia (from @The_Har). … The Royals’ Indpendence Day cap has surfaced. … The new Bryce Harper Gatorade commercial includes a Mets player wearing triple digits (from Cork Gaines). … To get into the All-Star spirit, a skyscraper in downtown Cincinnati will have a pillbox cap and mustache placed on it (from Jon Kramer). … The list of the five worst MLB Draft misses for each team has a nice touch with photoshopped caps for what could have been (thanks, Jonathan Daniel). … Cardinals manager Mike Matheny did a media session while wearing a pregame-used Cards/Blues hockey jersey. … Here’s a look at what might have ben the very first baseball uniform (from Phil). … Maybe you all have seen bigger, but Jorge Soler rocks a pretty thick chain. 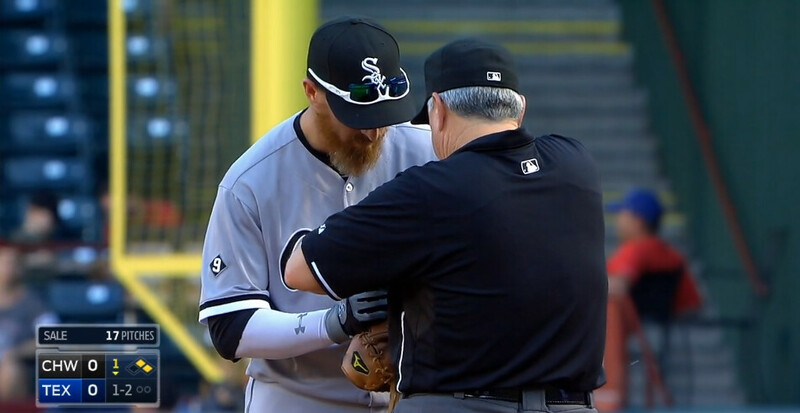 … The first base ump helped White Sox 1B Adam LaRoche fix the laces on his mitt last night. … There was a charity softball game last night to honor the memories of several slain New York police officers, and there was a lot of chatter about the sight of New Jersey Gov. Chris Christie in a uniform. Hey, give him credit for putting himself out there like that. Meanwhile, Rudy Guliani wore golf cleats. Further info and photos here (from Phil). … The Indians bullpen held teammate Brandon Moss’s 100th career home run ball hostage. While almost every reliever asked for an Apple product, Mark Rzepczynski also requested a 50-gallon drum of lube. … Someone wore some snazzy Texas socks during Rangers batting practice (from Mike Klug). … The Marlins are playing the Cubs this week, and Miami gave away Back to the Future-inspired “2015 American League Champions” T-shirts. Part of the film’s plot was that the Cubs would beat a Miami team for the title in the far-away year of 2015 (thanks, Andrew Cosentino). … Illinois stand up! Two great stirruped matchups in the state playoffs, one between Montini and Nazareth, and one with Champaign Central and Champaign Centennial (from Steve Johnston and Jonathan Mayer, respectively). 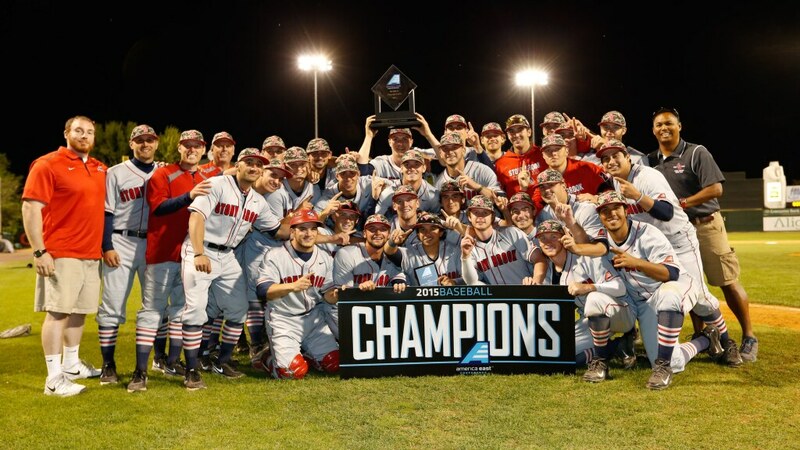 … Stony Brook won the American East tournament to go to the Fort Worth regional. “They had beautiful unis, beautiful striped socks, and ruined the whole look with camo caps,” says Eric Wright. … Texas A&M and Cal had dueling rally caps on Saturday night. Then the next night, Iowa and Oregon had a cap stacking battle (from Kary Klismet). ”¦ Star Wars jerseys tonight for the Tacoma Rainiers. 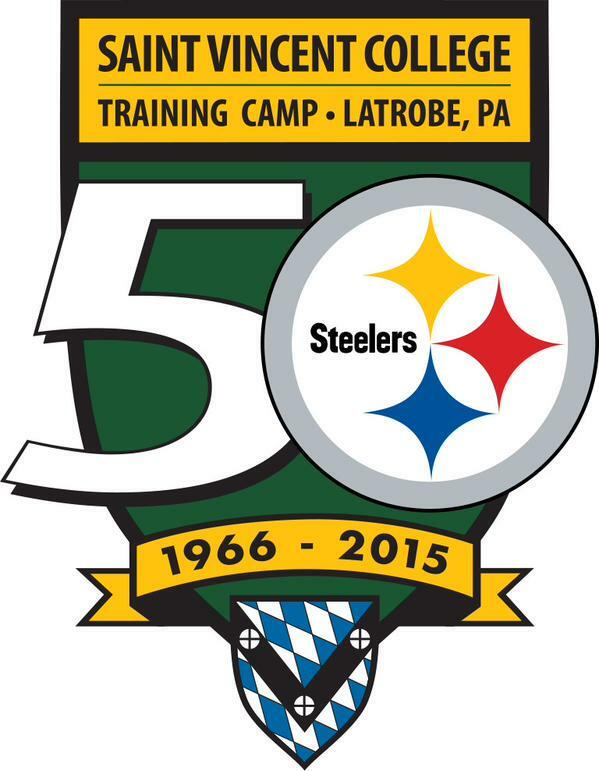 NFL and College Football News: The Steelers have a logo for their 50th training camp at St. Vincent College. … Though Marcus Mariota has the NFL’s best selling jersey, Tom Brady still leads sales among veteran players (from Phil). 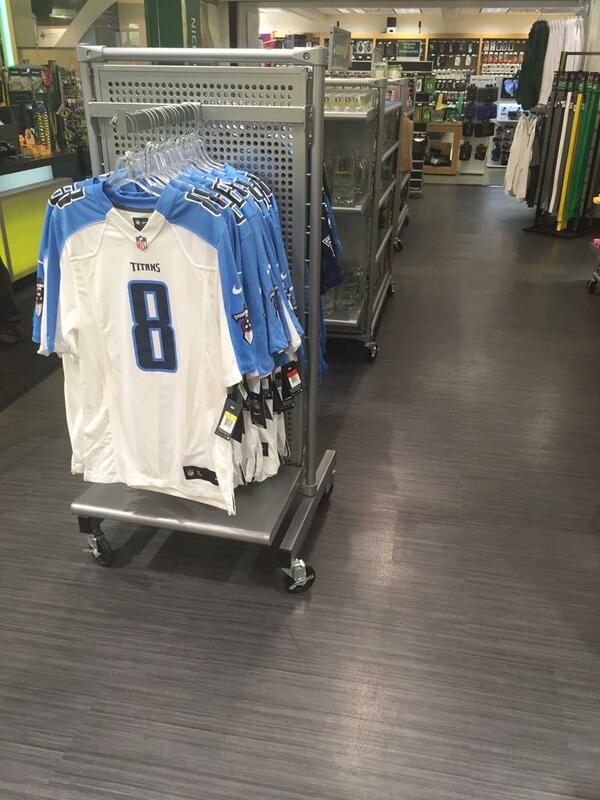 … Oregon’s university bookstore now carries Mariota Titans jerseys (from Ben Krakow). … An anonymous reader was at the Pro Football Hall of Fame recently and spotted someone that not only had the Steelers wordmark shaved into his head, but the team’s signature hypocycloids as well. … Giants rookie safety Landon Collins will wear No. 21 to honor Sean Taylor (from Phil). … Here’s a good look at the Browns new unis. … We’ve discussed striped NFL practice shorts in the Ticker a few times this week. “That’s a Nike thing,” says Stephen Volek. “The same shorts are made for all of the Nike college schools. If they have a signature line pattern, they will be on the shorts. If they do not have a design, like Penn State for example, it will be a solid line.” … Earlier this week we surmised Bowling Green might have new helmets, but that will not be the case (from Tom Konecny). Hockey News: The Islanders will keep their logo and uniforms after their move to Brooklyn (from Phil). … Looks like new alternates are coming for the Ducks, Flyers, Isles, Lightning, Avs, and Caps. … The lions statues outside the Chicago Art Institute are again wearing Blackhawks helmets (from Phil). … Hockey commentator Don Cherry wore a classic NHL tie last night (from Tom Gronek). … A makeup artist painted the Blackhawks and Lightning logos on her face. Soccer News: Real Madrid has a blue third kit. … D.C. United held a Peace Corps Night yesterday (from William Yurasko). … The LA Galaxy have a neat poster for Sunday’s match against the Vancouver Whitecaps. Basketball News: The latest Sporting News pieces by Phil are on the uniform histories of the Warriors and Cavaliers. … As we had been tipped off via video game leaks, the NBA Finals patch will appear on the back of the jerseys this year. Is this the first time in any sport that a championship series patch has appeared on the back of jersey, instead of on the front or the sleeve? … The shooting shirts for next year’s All-Star Game have leaked. ”¦ Check out this gallery of the most recent Sports Illustrated covers for every NBA team. I’m a little bummed about how long it’s been for the Bucks. … Here’s a compilation of some of the best Mitchell & Ness throwback basketball jerseys (from Phil). … Dennis Rodman has a Phil Jackson Knicks jersey (from Paul Lee). 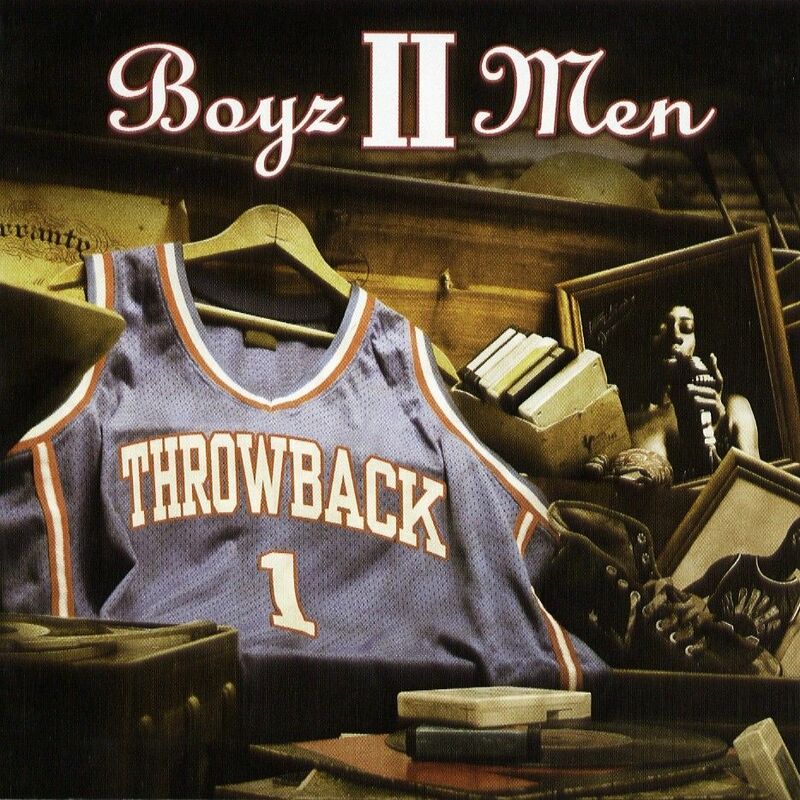 … In 2004, the R&B group Boyz II Men released an album called Throwback Vol. 1, and the cover uses a basketball jersey to display the title. … New wordmark for Tennessee? 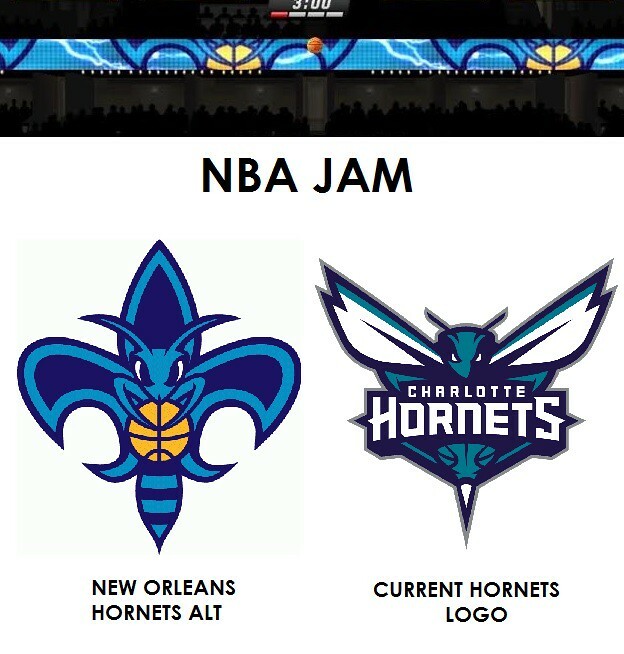 … The iPhone edition of the new NBA Jam has some inconsistencies with the Hornets. First, in the arena banner towards the top of the screen, the game scrolls the old New Orleans Hornets alternate logo in the background. Second, the Hornets scoreboard graphic is in Bobcats orange (good spots by Chris Goeller). Grab Bag: A Japanese company, called YKK, basically owns the worldwide zipper industry (from Andrew Rader). … Looks like BFBS has spread to the world of Greek yogurt (from Steven Zerhusen). 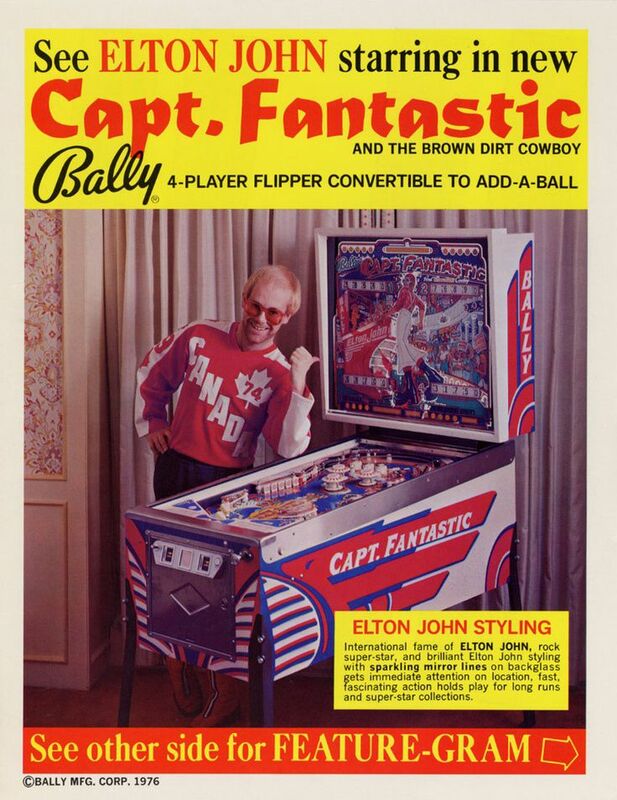 … Elton John wore a Canada sweater in a 1976 pinball machine ad (thanks, Bo Baize). … Move over bullpen buggies and helmet carts — here’s the Entenmann’s Donut Mobile. ”¦ Walmart is relaxing its employee dress code. Kudos to DC United for their Peace Corps night. No acknowledgment of this on their uniforms, unfortunately, but it’s a start. Kudos seconded. I keep waiting for a Washington pro sports franchise to recognize those who serve in the public sector other than in the five major armed services (NOAA and USPHS Commissioned Corps Night, NIH Researchers Day, US Forest Service Night); maybe they already have and I’ve been sleeping while it happened. Thirded. If we’re going to wield the pitchforks when teams let us down, they certainly deserve the bouquets when they hit the mark. Huzzah! Agreed that it’s worth lauding DC United for acknowledging the Peace Corps, but is it really unfortunate that they didn’t alter their uniforms for the occasion? Might it not be more preferable if none of these kinds of promotions (military included) obligated changes to a team’s standard uniforms? Agreed — that would be my preference. Big thanks to Mike and Garrett! Garrett, thanks for all your work and best in all your writing projects. Mike, great first season at the Watch! Hear, hear! I’ve enjoyed your ticker write-ups, Garrett. They’ll be missed. I’ve also enjoyed reading the various pieces of writing you’ve had published and shared with us during your stint at Uni Watch. Here’s hoping you’ll check in with us as more of your writing makes its way into print. Mike, glad you’re on board for the foreseeable future and expanding your role. I can’t wait to see what you have in store for us! Let’s call it the “ambient smell of…farm” that often greeted me when I arrived in the parking areas near Penn State’s Beaver Stadium wasn’t particularly pleasant, but it reminded me of lots of good tailgates and football games. My relationship with my alma mater is now in the “it’s complicated” phase but all those Saturday afternoons with friends are cherished. 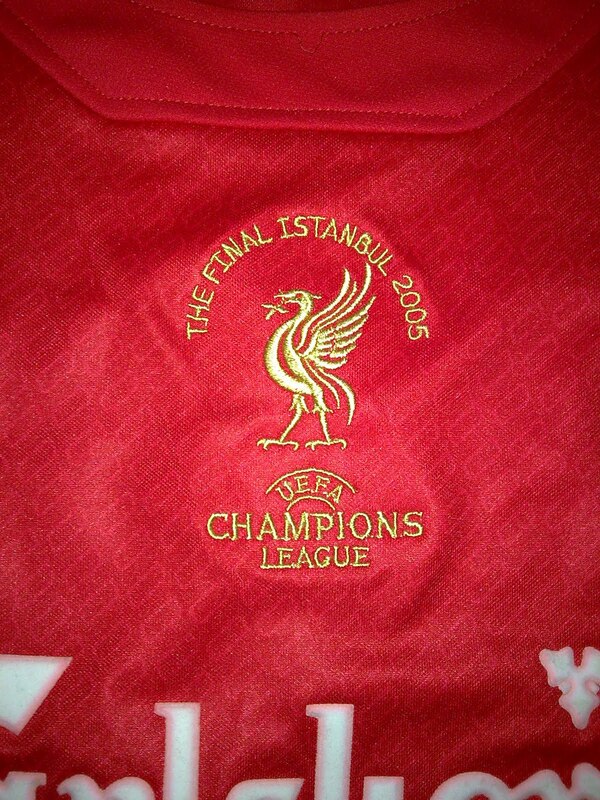 I won’t be the last and probably by the time I actually post, won’t have been the first, but it should only be the Champions League final. It’s just the one match, hence no plural. Fair enough — headline changed. But it’s worth noting that “finals” is a pretty strong colloquialism. People often refer to the Wimbledon finals or the French Open finals, e.g., even though it’s a single match. Now, you might say, “Just because people say it doesn’t make it any less wrong,” and I suppose you’d be correct. But the whole notion of final/finals has become muddied — witness the NHL’s use of “Final,” which is clearly suspect at best. I understand what you mean but it’s all rather irrelevant. The Champions League final just is singular based on at least a couple of decades of usage and moreover a general tendency in Europe to use the singular “final” pretty much exclusively, particularly in soccer. That is the only colloquialism relevant in this context. * World Cup finals (plural, lower case on ‘f’) refers to the 32-team tournament that is the culmination of a 4-year campaign involving all FIFA member teams. QotW: You nailed it on the worst smell in sports. Every time I think of Nassau Veterans Memorial Coliseum, the stench of wet hockey equipment, urine and warm beer is unforgettable. I am glad that building is becoming a memory. I prefer the bratwurst and onions at the White Sox games. It is more distinct and pleasant. I was once in a hockey locker room and that is the worst smell in sports, second worse overall. Gotta ask, what’s the worst smell overall? That zipper article in the Grab Bag is sensational — highly recommended. One of my first obsessive observances as a kid was of the YKK on zippers. Being the Internet age and all, I researched the company long ago but didn’t know anything about it being so self sufficient. I’m somewhat surprised they only have 50% of the market. Very interesting article. Great UCL write-up. 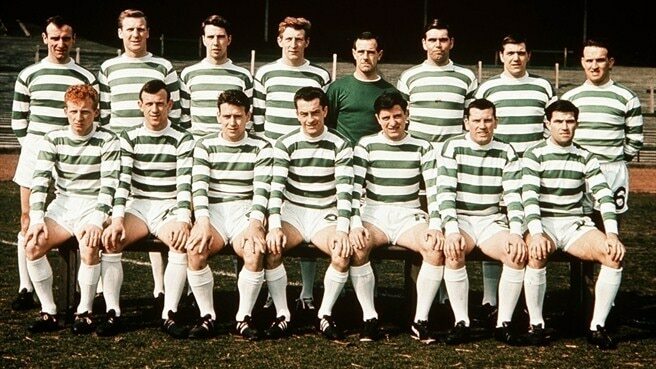 My choice for best uni match-up would have to be Celtic in either 1967 v Inter or 1970 v Feyenoord. Hard to beat those green hoops. There was “Ã—” put in where there was meant to be “x” in the link. Not sure why that happens but it’s usually the first thing to look for when a link mysteriously refuses to work. Anyway, both good choices but I think the Inter game looks better, just because the Feyenoord match-up features just a bit too much white overall but also because Inter’s blue and black stripes has always been one of my favourite looks. Both are good choices – I’m a sucker for stripes vs stripes (or hoops or halves). Though if the Celtic and Feyenoord matchup happened today, UEFA would make one of the teams change because there’s too much white clashing (though they did let Atletico wear red/white vs Madrid last year). Plus, the Feyenoord goalkeeper appears to have worn a green jersey. 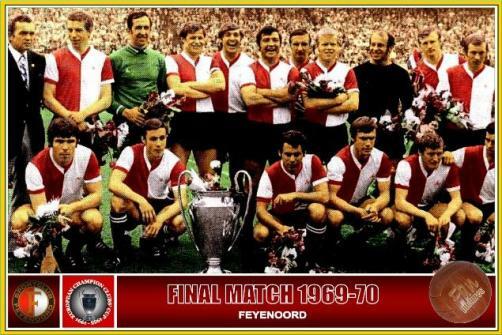 Celtic played Feyenoord a few years ago in the Champions League and that match-up was allowed. So many good choices for best-looking final. Bayern/Dortmund a few years ago was pretty good-looking, but the runners-up then don’t have the same cachÃ© as Juve. Man Utd & Chelsea, in ’08, both wore their first-choice kits (save for United’s white socks). But, really, just perusing the HFK images, it’s hard to find an ugly Final until about the mid-’80s (certainly by the early ’90s), when clubs started to break from their fairly traditional looks, as well as add sponsors. The smell (and taste) of the stadium mustard at Cleveland Municipal stadium. Almost enough to banish the competing odors. And the smell of nacho cheese reminds me of the Richfield Coliseum. The vendors used to get either a hot dog, a little pizza or a soft pretzel. On the days I asked for a pretzel I would also get a small cup of nacho cheese for dipping. The smell of fries and gravy reminds me of the Civic Arena. First time I went to a Pens game I ordered fries and they asked, “You want gravy with that?” I thought, this is my place, and these are my people! Any chance you can use the ‘farewell’ Mike Chamernik picture for the Mike Chamernik ‘Question of the Week’ picture? Hehehe I really, really hate taking pictures. Those are two of the only three or four photos that exist of me over the last four years. YES! Meant to add this earlier. Props. How long do you think it will be before the Browns change their uniform again based on this one being laughed at to death? If only the NFL didn’t have it’s stupid 5-year rule on uniforms now. Seriously, what the hell? Let the teams change when they want to. It didn’t hurt anyone when the Patriots had their little identity crisis in the 90’s. Anyways… I think this uniform lasts the required 5 and that’s it. Year 6 will probably be a return to the previous “classic” uniform. All High school gyms smell the same, AND it’s a combined smell of sweat and popcorn. Best o’ luck, see ya round the Uni-verse. The smell of cooking lard always reminds me of basketball games at my alma mater, Mercer University. Back in the day they used lard in the popcorn maker. It was the greatest popcorn ever and it stayed hot for far longer than any popcorn had a right to. Sadly, when the teams moved from Historic Porter Gym into Hawkins Arena in 2004 the school switched to air popped corn. It is healthier, I suppose, but it lacks the flavor and character of the old oil popped lard corn. Lard-cooked potato chips (like Grandma Utz’s) are the best. Several Pennsylvania companies make them, but you don’t often see them outside of the state, because they have a shorter shelf life than oil-cooked chips. For popcorn, I usually use bacon fat (which wouldn’t work in a commercial-grade popper, of course, but it’s fun at home). Is bacon fat considered to be lard, or is it entirely its own thing? Bacon fat is just fat that’s poured off from the skillet after making bacon (which is from the hog’s belly). I keep it in the fridge and then use it, sparingly, for various cooking tasks, including making popcorn. I love the smell of a freshly opened can of tennis balls. Oh my, you just unleashed a torrent of olfactory flashbacks with the mention of a freshly opened can of tennis balls. OK, that’s a memory that’s still vivid, 30+ years after graduation. Although we *never* got new balls for practice — but I would, once or twice a year, slice open my finger upon opening a new can for a match. But yes, the smell of a fresh can (so long as no blood is drawn) is one I can totally relate to! If the lid didn’t come off cleanly, you could cut yourself on the jagged rim, too. Still, you gotta love that sound and smell. Every time I open a new can, it takes me back to being ten years old again. I’ll second the tennis balls. Haven’t played tennis in a long, long, time. The old metal cans had a pull tab. Are the newer ones still like this? and is the smell still as potent? Everyday hockey smells you can get somewhat used to if you play often enough; it’s the guy that hasn’t aired out his equipment and has had it sealed and fermenting for months that gets to you. I think the main reason players get upset with the glove ‘face wash’ isn’t the physical hand in the face (it’s that too) but I think it’s more it being a dirty, sweaty, smelly glove. they do. the plastic cans hold the smell just as good. That “pfft” sound is another favorite. Heh. Before the pull tab was created, underneath every plastic lid was a key that you used like a can opener. It made an even more vivid sound when the pressurized air was released. Yes a million times on fresh tennis balls. YES on tennis balls. The pull-tab pop is pretty sweet, too. The simple smell of the leather of your baseball glove. It’s the best! Also the smoke smell from your wood bat when you sting a solid hit is pretty sweet too. Garlic fries — Right Field in then PacBell Park,Giants vs. Pirates. Day game, took the train up from Millbrae. First time I’d been to a game since my hair had gone white, and I neglected to wear a cap. First time sunburning my scalp. Good times. As much as I hate cigarette smoke there’s a certain scent of it that reminds me of going to NFL games when I was young. Walking through the parking lot for games at Lambeau Field. Best-smelling parking lot in sports. I would take the leather glove smell a step further: I love the smell of *oiling* a glove. The combination of leather and Glovolium — mmmmmm, smells like spring. I would definitely agree on the smell of breaking in a new baseball glove with some sort of glove oil. On the other hand, I remember playing junior high basketball, going for a rebound, and somehow ending up with my nose in a much mature player’s quite moist and hairy armpit. Oh, that would constitute my least favorite athletic smell and experience (and yikes, I’m now having flashbacks). The smell of the sausage and pepper subs at old Shea Stadium. I would sit in my lab at Stony Brook U. salivating at the thought of going to a night game and scarfing down one of those heroes from heaven. A newly refinished gym floor. Smoked tire rubber from a victorious driver’s celebratory burnout. My favorite smell in sports is the smell of a hockey bag. It smells terrible to everyone else, but to me it represents the most amazing sport in the world. The awful, beautiful smell of a municipal ballfield a day after being mowed, when lines of cut grass are rotting in the summer sun and giving off that particular odor of leafy decay. Don Cherry’s tie had to be made in 1996-97. Thats the only year the Sabres goat head logo and the Hartford Whalers existed together. 1995-96 Sabres were still blue and gold and 97-98 Was the first year of the Hurricanes. I have the same tie. I used to wear it to all my travel hockey games when we had a tie dress code. QOTW: Baseball gloves #1 for best smell. I remember throughout little league and pony, as I was in the field getting ready for the next pitch, i would put the glove up to my face ad take a sniff. Still do it today as soon as I put the glove on. Also, the smell of tailgating going into a football/baseball game is always a “I’m here” smell. Champions League final also marks the debut of the new Adidas boots, getting rid of still in use models, Adidas introduces only three silos: “Ace 15”, “X 15” and… of course “Messi”. Ace is under the motto ‘control’, players who are gonna wear them are Manuel Neuer, Mesut Ozil and in the Champions final Ivan Rakitic for example. X is under the motto ‘chaos’, players to wear them include Gareth Bale and in Champions final Luis Suarez for example. And Messi well…. they are for Messi. I used to be really into football boots when I was younger, always eager to check out the new designs once they got them in at the local sports Store, but I kind of groaned reading this. I can’t tell however whether it’s because I simply outgrew that and have an overly romanticized idea of how “classy” those designs were, or because the whole scene is genuinely as needlessly flashy and convoluted as I think. I’ve never had the sense that soccer boot culture is quite as big of a thing as basketball sneaker culture, but that just may be because soccer didn’t get the coverage in the U.S. that basketball did when I was growing up. From your perspective, Padday, do the two scenes play out on a similar level? And if anyone else wants to add their perspective, I’d love to hear it, too. A little late on the reply, but I’d have to say that the soccer boot scene really suffers from the fact that you can’t really wear soccer boots as everyday footwear. The only real market for new developments are the real niche anoraks who follow that scene intently, certain sections of the media who get targeted by the manufacturers because they know they’ll have a fit over a spate of players wearing pink boots or something equally outrageous and then finally the only people who regularly buy new boots in great numbers: kids playing underage football. Hence, most boots that get made are made to appeal to children – so lots of flashy crap, and to enrage fogeys who’ll give them free publicity – so again lots of flashy crap. Regarding Don Cherry’s tie: At what point does something become “classic”, instead of just being “old”? The Sabres’ Radioactive Goat logo is classic? So soon? Where TtC is Time to Classic, a(AA) is the age at which an adult is able to acquire a thing, and a(YD) is the age at which that adult first had a youthful desire for the thing. So for inexpensive things such as music or sports logos, TtC might be as little as 5 years – the thing a 13-year-old wants, he can likely afford to purchase by the time he’s 18. For more expensive items such as cars, TtC can be as high as 50+ years, if the thing reaches the point at which its age produces appreciation in value faster than annual wage inflation. The placement of the Club World Cup winner’s patch feels really wrong, especially since they’ll lose that patch in December. I think the central placement has looked worse and tends to clutter up the upper part of the jersey so I’m OK with the way it at least kind of counterbalances the club crest. I assume the Adidas logo will drop down once it’s gone in the new year. I think the winner’s badge is just too big in general. I’d prefer a much smaller, elegant solution if we’re going to honor the champions. 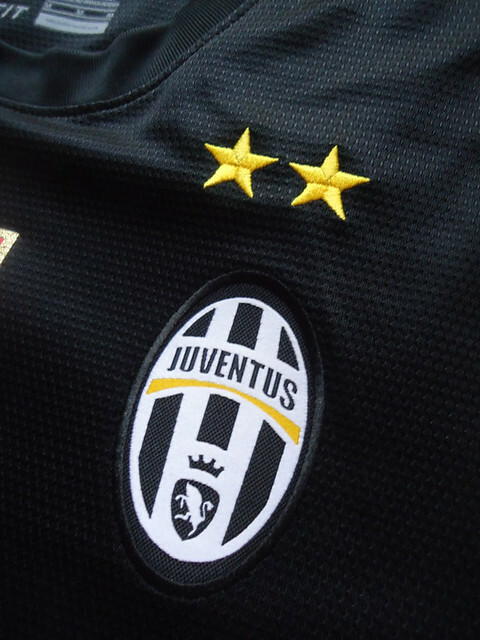 The Scudetto shield on the Juventus jersey isn’t too bad, and the collar tab on NBA jerseys isn’t bad either. The Premier League champion has a golden version of the white BPL patch that every team wears on their sleeves. I think that’s better than an additional patch elsewhere on the jersey. Box lacrosse is a summer sport in Canada. If you think a hockey rink smells bad, try attending a game in the middle of summer in an old unventilated arena. For my local team, I can smell the bench from the seats at the top. Artist Dave Christensen included in the backglass several depictions of people doing things that, at first, escaped notice by Bally management. A small number of games with these so-called “X-rated” or “uncensored” backglasses made it through production before changes were required to be made. Specifically, small mirrored stars were added over the objectionable parts and, curiously, these stars did not effectively obscure the offending art in all instances. The first pic, BTW, depicts Bally’s VP of Marketing. The ’70s were soooooo weird. Wow! Great background info! Thanks for posting! I rarely post to them, but Mike’s Questions of the Week (and the responses they engender) are one of the most engaging things about UniWatch. And people who have the courage to write for a living are among my heroes. Godspeed, Garrett. Thanks for the good wishes, I know I’ll need them. I will mention again what I have said before about the Islanders’ logo. The problem with the Islanders’ current logo is that the map of Long Island shows only Nassau and Suffolk. This matches the colloquial use of the term “Long Island” that has been current since the 1960s. Before that, however, it was very common to refer to places in Queens and even Brooklyn as being on Long Island. Up until the 1950s, people routinely wrote “Jamaica, L.I.” and so forth on envelopes. Long Island University was founded in Brooklyn in the 1920s. (By the way, that school’s teams also play in the Barclays Center.) And Long Island City is a section in Queens; it was formerly a separate city, and was a party, along with the cities of New York and Brooklyn, to the consolidation of 1898 which created the modern New York City. It will be something of a challenge for the Islanders to position Brooklyn as part of Long Island. But it won’t be impossible, considering that it is part of the geographical island. But that logo is a problem. It would be only a small tweak to alter the logo to include the entire geographical island. A user at the Chris Creamer board who goes by the name of Discogod created such a logo. We can see that the S is framed by Jamaica Bay. And the I points to the approximate spot of the Barclays Center, just as the I in the current logo points to the approximate spot of the Nassau Coliseum. I couldn’t agree more. I understand the politics behind this, but it’s inconceivable to me that the Islanders wouldn’t incorporate the location of their home ice into their logo. Re the NHL alternate jerseys for Anaheim, I would guess the third jersey would be orange as they wore for the Stadium Series at Dodger Stadium against the Kings. The Ducks have really been pushing “Paint It Orange” with a hashtag campaign, passing out orange t-shirts, bangers, and towels, and selling flags. They seem to be trying to force the fans to make the entire arena orange. Worst would have to be the locker room after hockey practice, when I played in HS. Best; The smell of the rink just after the Zamboni had re-surfaced the ice. Best smells I can recall, morning soccer practice and mornings at the swimming pool. Just something about that time of day with the grass or the chlorine. But the winner, hands down—raking and then burning the leaves in the fall while listening to the Bengals on the radio. Spilled Beer, Hot Dogs and Smoke (tobacco or weed,) remind me of the Oakland Coliseum in the late 70s early 80s. As a young kid (before MLB cashed in on the nostalgic, family vibe marketing,) going to a ballgame felt like I was privy to a man’s man world. It didn’t seem like there were a lot of kids at these games (weekend day games not included.) There were a lot of dudes drinking, smoking and cursing at that sellout primadonna Reggie. The smell of taquitos being deep-fried at the concession stand for the baseball fields where I played my Little League baseball games growing up. And that initial whiff of sugary syrup and artificial flavor additives from the unholy mix of fountain sodas we referred to as a “suicide.” No way I would even think about drinking that now! Also, Rosenblatt Stadium in Omaha, former home to the College World Series, had a unique smell that I’ll never forget. A combination of musty old wooden seats, sun-baked concrete with a hint of spilled beer, cheap nachos, and the dust of five decades of previous ball games. I love the way ice rink lobbies smell. Particularly the ones build before the 1990s. Every rink smells differently. I love how my equipment takes on the smell of the rink I’ve been playing at, it’s so distinct that the next time i start putting my equipment on, i can tell where I last played. To this day when i’m back in my hometown and go to the rink, I’m immediately shot back to some of my best childhood memories. Two “best” smells: First, the smell of leaves (burning?) reminds me of football because my HS team’s field was essentially surrounded by woods and you were allowed to burn leaf piles back in the day. The other smell is that of burning pipe tobacco. My dad used to routinely smoke a pipe while we’d watch games on weekends, and whenever I smell it I’m taken back. Worst smell? My son is a soccer goalie, and whenever he gets into the car after practice or a game and takes his gloves off, the smell is overpoweringly bad. Impossible to describe. Congrats to Mike on his promotion, & many thanks to Garrett for his contributions to the site. And while we’re wallowing in gratitude, big props to Mr. Lukas for bringing these two fine young writers into the fold. QOTD: For me, the conversation begins & ends with the intoxicating aroma of a baseball glove. My second fave would have to be a freshly-cut infield or fairway. Thanks, Hugh! And yes, props to Mr. Lukas, fantastic boss! When I went to my first Rockies game in the 90s, I had the feeling that something was missing. Then I realized that baseball games are supposed to be accompanied by the sweet smell of a stogie, like the Omaha Royals games at old Rosenblatt Stadium in the 70s. It’s kind of like going to a rock concert and not smelling marijuana. QOTD: Fresh cut grass and a 7am tee time at my favourite golf course. At first, I was really upset about the whole “Pandering” NOB on the back of the T-shirt because I like the look of the shirt, and would wear it if it weren’t for that. I posted on here and asked if it could be removed. I enjoyed reading Paul’s explanations for why that’s not an option. I may not agree with point of view, but I respect it. I realize, as I look at it now, that it’s Paul’s expression, and I don’t like, so I won’t buy it, but it would be almost “un-American” (or perhaps is it very “American”) to demand that he change his expression so he can sell me a T-shirt. Good responses everyone. I didn’t know cigar/cigarette smoke was revered. I will say it does set a pretty distinct mood. The smell of convenience-store sweet tea reminds me of softball. As a 15-year-old I got to play in an adult slow-pitch league. While my brother and our teammates sipped on post-game beers, I’d drink from my quart-sized jug of tea. I can’t imagine ingesting that much sugar now. I love reading about all the smells! I’m going to leave aside food myself cause that feels like a huge part of sporting events but also tangential somehow. I like the smell of a auto race. The gasoline fumes, the rubber burning. There’s nothing quite like it IMO. YOu’d think it would give you a headache or make you nauseous at those PPM and over such long days, but it doesn’t…it just kind of moves into the background and mixes with the smell of grills and suntan lotion and everything else. Best smell: burning rubber/oil/exhaust (and whatever else that smell is made up of) at Daytona the first few times the cars come around. The cool, chemical smell as I walk into a rink. I haven’t played competitively in many years, but it still gets my heartbeat up. 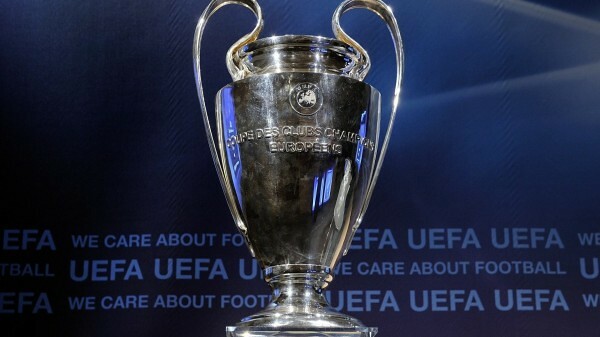 In regards to the Champions League Final article, I agree that this year’s final is very attractive and represents both clubs well. I still think that 2011-2012’s final of Chelsea v Bayern as well as 2012-2013’s final of Bayern v Dortmund are also up there. Chelsea Blues are a classic, and in a league of their own; Bayern and their red kit are classic as well; and I think Dortmund wears the yellow/black the best out of all the professional soccer clubs. i normally would rather play with a squashed frog then read a “guest” entry, but today’s was very well done to say the least. go bundes-doh. by the by, i got’s a keg of schlitz that i am itching to rid myself of @ .10$ a brew for anyone interested in wearing the right proper hosiery of the day to the looped sock-bang. it might get blue. a purple acid rain will fall on UIC tonight. gon’a have to strap it to the schwinn to get it there, but riot riot riot betwixt 6-11 central at the u of ill chicago. When I attended speedway meetings, the smell of Castrol R fuel from the 500cc bikes when they started to rev up their engines was intoxicating. Thanks for all the work you did for Uni-Watch Garrett! And best of luck to you for the future. Also, congrats to Mike for ‘earning’ some extra duties. I, for one, really appreciate your contributions. Oh, and as for the smells, mine is that fresh cut grass smell that seemed so apparent when I played football. As a fan, I don’t get that smell as much, but every once in a while I’ll get a little scent of it, and it always takes me back to my playing days. Best – the smell of Zamboni, er ice resurfacing machine, exhaust and fresh ice in an unheated youth hockey rink. The smells of sports – great topic! Of course, I expect nothing less from a fellow Blue Demon! There’s a combined smell of popcorn and roasted almonds that take me to UM’s Crisler Arena when I was a kid. The same combo didn’t seem to make it to the remodeled arena. But nothing comes close to cigar on a cool day – reminds me of Michigan Stadium back when smoking was allowed in the stands. Whomever mentioned the cigarette smell waaaay back in the comments hit the nail on the head. Love the smell of onion rings at the local fair and of course street meat at a MLB ballgame. Worst smell: the sewer of a metropolitan area on a hot and humid day while walking to the ballpark. QotD: One of my favorite smells (as mentioned by others) is at the race track. You have all the “great” smells of the stands (food, beer, B.O., etc.) plus the burning fuel and rubber. Quite the distinct aroma. Have the Cavs worn their home whites or road burgundy uniforms in the playoffs at all? It seems like everytime they play their either in the alt gold or alt navy blue ones. They wore their whites twice in the first-round series against the Celtics and once in the second round against the Bulls. Nashville Sounds looking good in their Nashville Vols turn-back-the-clock uniforms in tonight’s nationally televised AAA game on CBS Sports Network. QOTW comment: I miss the smell of cigarettes and cigars. High school football with the row of fathers at the top of the bleachers, and a cloud of smoke around them. I hate the lung disease associated with this memory, but I went to a local baseball game, and the smoke in the air was missing, and so was much of the charm.